Loose Lips is a diverse and eclectic musical collective founded by the London based Medallion Man who is also the A&R behind the legendary 20/20 Vision Recordings. Meanwhile, Kortzer is a techno & electro producer whose production work has been supported by luminaries such as Juan Atkins and Andrew Weatherall. With support from NYC’s breakbeat master Wavewhore and the purveyors of live fusion bass culture known as the Tsunami Bass Experience. 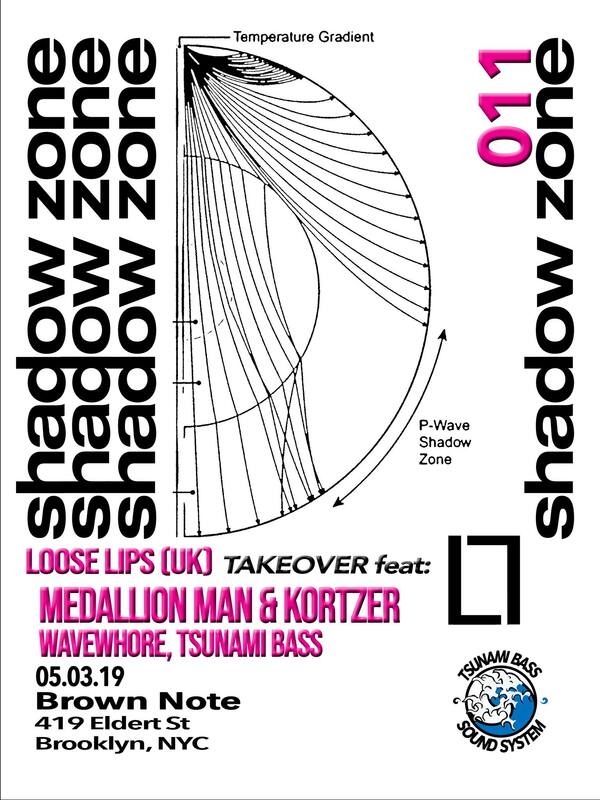 Join us in the shadow zone where waves are refracted as they pass through the boundary between the mantle of the Tsunami Bass sound system and the artists at its helm while they deluge the sacred space in an excursion of multi-sensory immersion!! Tsunami Bass is one of New York City’s premier sound systems and specializes in low-end frequency and bass culture appreciation. Cover Notes: $20 Presale... more at the door.